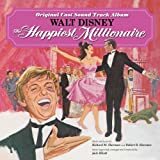 Accueil Bande originale Paroles Chansons Fortuosity – Paroles de la chanson dans “Le plus heureux des milliardaires”. Fortuosity – Paroles de la chanson dans “Le plus heureux des milliardaires”. Ain’t this an elegant neighborhood. All the residents dress so fine. One day off the boat am I. With a job that’s nearly mine. ‘Tis a job with an elegant millionaire. Today I move from immigrant. Now you may call that luck. And you may call it fortune. Sometimes castles fall to the ground. But that’s where four leafed c-lovers are found. I don’t worry ’cause everywhere I see. That every bit of life is lit by fortuosity. ‘Round the corner under a tree. Good fortunes wait and wait and see. I keep smiling ’cause my philosophy. Is do your best and leave the rest to fortuosity.